When designing any project in the 21st century, it’s crucial that we, as architects, begin to question our designs from the perspective of impacts on the environment, society, inhabitants, and so on. Within these broad categories are specific areas that we can design towards in our projects. For example, compared to the early 20th century where information was not as easily accessible as it is in our 21st century world, we’re able to find data on nearly every product that we use in our projects. This data includes where the materials are sourced, how they’re processed, information about their physical properties, and standards of care that are followed. One of the important things that I’ve learned from the prefab green book is to create a database of research for a particular typology that I’ll be designing. In lieu of developing a specific research folder for one project, having a broader and organized database that can be utilized for every project within my architecture niche will allow me to build on the information, update it over time, and incorporate the knowledge into my designs. There’s a responsibility that every architect has which is to design for positive impacts in our world. The projects that we realize in our built environment should add value and avoid adversely impacting the world. The database that we put together for our firms should include materials and design ideas that focus on being a solution to larger issues in our world today and in the future. In the case of Kaufmann and her sustainable modular home designs, her firm began and thrived from her initial project which was a prefabricated home that she designed for her family. During her search for a house to purchase for her family in California, Kaufmann was unable to find something that fit her design sensibilities that fell within her family’s budget. So, she decided to purchase a plot of land, design, and build her own home. As she set out on this project, Kaufmann took all of the ideas that her career as an architect has been influenced by and distilled them in her design for her home. These ideas included sustainable building materials, passive design strategies, modular building constraints, and an overall attention to schedule and budget. In essence, her home had to be designed around the best practices for sustainability, prefabricated in modules at a warehouse, and put together on site all within a budget that would make sustainable architecture affordable for more of the American population. Just like Kaufmann took a chance with her home, we need to be willing to take a risk with our design proposals for all of the projects in our office. There are always better ways of doing something within a budget and more often than not, it involves creative solutions. Kaufmann’s designs brought sustainable architecture to more people in our world by making it more affordable than the green and smart homes that were showcased in publications. How can we continue to bridge the gap between sustainable design and the average person in America? Kaufmann’s book is filled with so much information about sustainable design techniques, materials, and ideas. As one of the innovators in the area of sustainable modular home designs of the 21st century, her work has changed the ideas that we once had about the builder designed kit homes of the 20th century. After reading the prefab green book, I’d like to take a different approach to sustainable prefabricated architecture that’s similar to the way that Case Study House 8 was designed and built. In other words, I’d like to focus on designing low cost sustainable houses that are similar to the way kit homes were designed in the 20th century, but using technology of the 21st century. I’ll have to learn more about new building materials that are readily available, building techniques that can reduce build times without sacrificing quality or increasing costs, and developing a database of components that can be analyzed to form a set of design constraints for project 28x30. This probably means a lot of critical thinking and online searching over the next few weeks to develop this database. 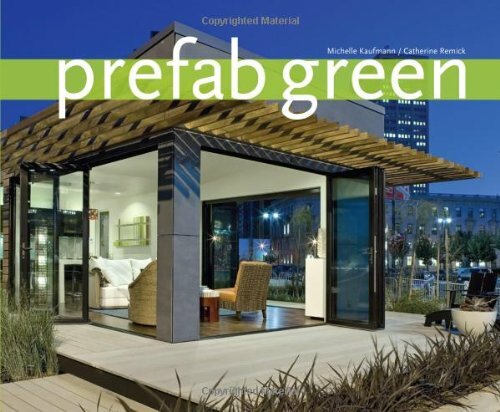 If you're interested in Michelle Kaufmann's book, prefab green, you can find it linked below. Thanks for following me on this kit house journey and feel free to let me know if you have any comments, suggestions, or questions in the comments section below!